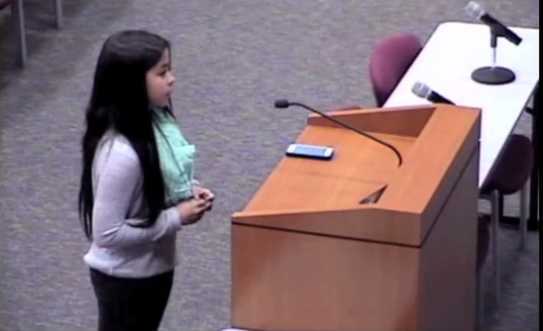 KATY, Texas — A middle school student in Texas who made national headlines last month when she expressed concern to her local school board over an assignment that required her to deny the existence of God as fact is seeking an apology for what she says are “lies” that were disseminated by the district. As previously reported, Wooley, a seventh grade student at West Memorial Junior High School in Katy, went before the board last month to outline that she was uncomfortable with the assignment as a Christian. “When I tried to argue [in favor of God’s existence], she told me to prove it,” Wooley said. The Katy Independent School District investigated the matter, and soon released a statement declaring that the particular statement at issue was “unnecessary for achieving the instructional standard.” However, it asserted that the teacher herself is a Christian, and that the assignment had been misunderstood. But Wooley says that some of the district’s statements were untrue. Wooley stated that since the incident, she has been called names and told to kill herself. She quoted Scripture’s exhortation from 1 Peter 3:10 that those who wish to enjoy life should keep their lips from speaking lies, and pointed to Christ’s words from Matthew 10:33.